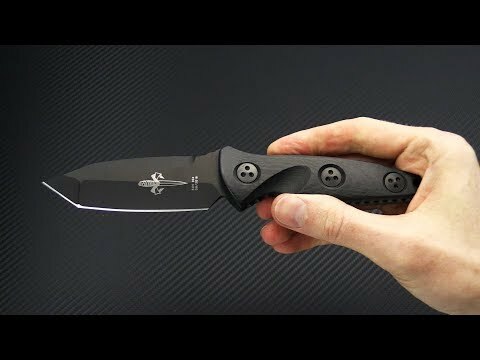 It took over a decade for the designers at Microtech to bring us a fixed Socom and the Microtech Socom Alpha Mini is a more compact variant on this elegant, tactical design. It offers all the same innovative design element and premium materials we've come to expect from Microtech including proprietary hardware, a razor sharp edge and precision fit and finish. This version comes. Blade: The Socom Alpha Mini features a finely ground M390 blade which comes to a fine Tanto point with Microtech's "Star Grind" which delivers a visually striking ridge at the transition of the Tanto point. The blade has a two-tone finish with satin flats and tumbled grinds under a fine black DLC (Diamond Like Carbon) coating. Handle: While a lot of companies are quick to throw a slab of material on the handle and call it a day, Microtech takes time to deliver a comfortable and secure handle with refined contours and peerless fit and finish. This variant of the Alpha Mini has twin Carbon Fiber scales with full jimping around the raised tang of the handle for added grip in hand. Black proprietary hardware securely fixes the scales to the tang with an extended portion having a hole for lanyard attachment. Sheath: Premium Kydex with a carbon fiber pattern is used, and everything locks in tight with two Blade-Tech molle loks for tactical carry. Comes with padded nylon zipper pouch for storage, microfiber cloth and signed Declaration of Authenticity plate.